Welcome To TGS Endodontics in Sandy Springs! Our staff is dedicated to welcoming patients to our office in the same way they would welcome them to their homes. We believe your first encounter with our Endodontic office in Sandy Springs should be a comfortable one, from the time you first call, to the time we say good-bye. We are here to serve you and to acquaint ourselves with your needs, your problems and your fears. 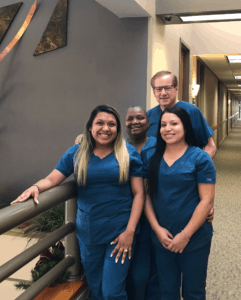 Fully trained in the latest technology and procedures and protocol specific for root canal therapy, all of our dental assistants are fully certified. Our managerial staff is well versed in such business matters as insurance procedures and will seek to accommodate you in all areas related to treatment. Our goal is to be 110% positive, whether interacting with patients or co-workers, always remembering that you, the patient, is our reason for being here! Our office hours are Monday to Friday by appointment, but we’re always on call for our patients, or anyone requiring our services! To provide you with the highest quality endodontic care in a friendly, comfortable environment. We are committed to excellence in our field, and will utilize the latest technological advances to ensure you receive the absolute finest care possible.